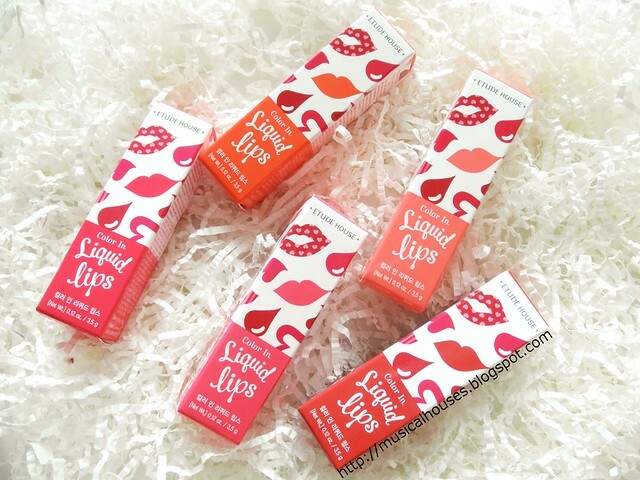 Etude House Color in Liquid Lips Review and Swatches! Etude House's Color in Liquid Lips has launched here, and according to their website it's a as a "melted liquid lipstick with the intense color and high shine to make provocative yet lovely sheer lips", with "cushiony water-sliding texture" to keep lips "supple and hydrated". In that sense, it's a product that's sort of a hybrid between a lipstick and a lipgloss - a liquid lipstick, if you will. Based on appearances, it's fairly similar to the Dior Addict Fluid Sticks and Maybelline's Color Elixirs, and even looks like a lipstick, although it's actually a lipgloss! Of course, this is Etude House, so the Color in Liquid Lips comes packaged with a fanciful, princess-y feel, with cute, girly lip motifs. There are 20 shades of Color in Liquid Lips in all, but I have 5 of them here, ranging from orange-based shades, to pink-based shades, and to reds. So far, they seem to be getting good reviews from other bloggers, so I thought I should get around to reviewing these too! Of course, I wouldn't be a good blogger if I didn't have swatches and reviews for you, right? But, because I'm something of an ingredients geek, let's start by dissecting the ingredients in this product! I promise it's more interesting than it sounds! Below, the ingredients lists for all 5 shades that I have. You can see that there are some slight differences in ingredients between shades. The differences lie primarily in the shades of pigments used, which provide the different colours in the range, but there are also some minor differences, such as the order of ingredients further down the list. That said, the bulk of the ingredients are the same, and the difference in ingredients from one shade to the next isn't sufficient for me to feel any difference in application between the shades. 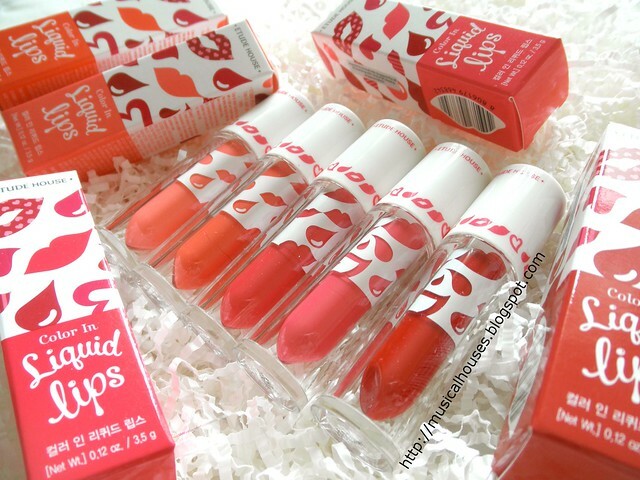 The first thing you notice is that the Etude House Color in Liquid Lips is formulated to be very moisturizing. The first two ingredients across all the shades are Caprylic/Capric Triglycerides and Ricus Communis (Castor) Seed Oil, both of which are emollients. Then there's Mica, for that "ooh shiny!" effect, Dicalcium Phosphate, an opacifying agent, Polyglyceryl-2 Triisostearate, another emollient that does double duty as an emulsifier, Silica Silylate, a polymer that functions as a thickener and has emollient properties, Stearalkonium Hectorite, which is used as a thickener, and Diisostearyl Malate, another emollient. After that we get all the pigments that give the product its colour, and a bunch of plant-derived oils (Sweet Almond Oil, Sunflower Oil), and more polymers, silicones, thickeners, emulsifiers, frgrance, and the like. But in short, from the key ingredients, we can tell that this is a product that is formulated to be pretty emollient on the lips, so it should be prety moisturizing. The Color in Liquid Lips itself has a pretty interesting applicator shape, and it's basically a modified doe-foot applicator. Not too much to say about this type of applicator - it works well, and given the thick texture of the product, it's probably better than a brush, and it helps to spread out the product. I'm not sure what that hole in the middle is for, I assume it's to stop the applicator from picking up too much product? And below, arm swatches! The key thing is that unlike some of the previous liquid lipstick/lip cream type products Etude House has had, like the & Rose Rosy Lip Tints or the Color Lips Fit Lip Tints, these don't actually dry down to a matte finish, nor do they feel matte or dry on the lips. Instead, the finish is glossy and shiny, and the feel is quite moisturizing, owing to the emollients in the formulation. For those whose lips have found the other lip products too dry for their liking, this might be the finish that works for you - I guess that's the "water sliding texture" in action! 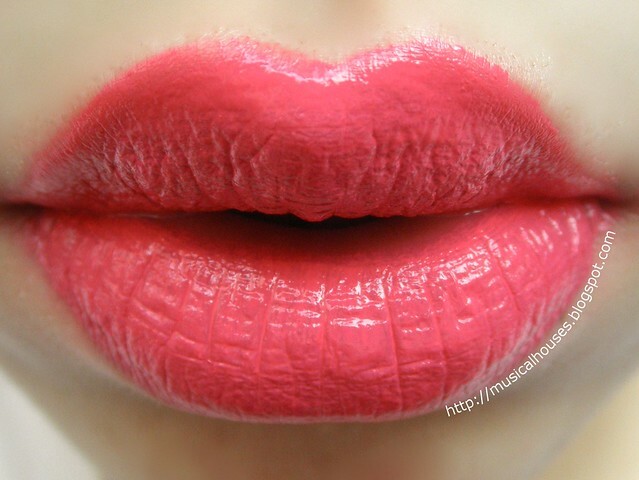 OR201 Juicy in Juice is a light, bright salmon pink, and on the more warm-toned side. OR205 Made in Sweet is a nice bright orange with a hint of pink that makes it more wearable. This colour really pops, and is quite bright. PK004 Rose in Bloom is a bright cool-toned magenta pink. This isn't the exact same shade of hot pink, but it is close. It is bright! PK006 Always in Pink is a cool-toned bright pink that is paler and not as deep as PK004. RD301 I Am in Love is a straight up primary red. Perhaps it leans a little warm, but it looks quite close to the fire engine shade of primary red. Now, for some lip swatches! Sorry these are a little messy - I promise that when you're not looking at my lips with 30x magnification, they don't look that bad in real life! So please excuse the smudgey bits here and there! Frst up, OR201 Juicy in Juice. This is a bit patchy when applied, althoug you can't really see it in the photo, which is a problem I don't have with the other shades. Perhaps it's because it's a pale shade, and my lips are pigmented? In any case, it feels nice and smooth going on. Honestly, this was not my favourite shade, because of the patchiness, but also just because it looked a bit washed out on me. Maybe this might be great for warm-toned, fair girls. Next up, OR205 Made in Sweet. You can really see the bright orange-y-ness of this shade here. It's very nice, although not quite my shade because it's a tad too orange for me. As you can see, this one has excellent coverage and pigmentation. Just a couple of swipes, and you get full coverage. It feels smooth and emollient too. Here is PK004 Rose in Bloom. It looks almost red in the photo, but trust me, it's not red - just bright magenta pink! This does have a bit of neon-ness going on when applied, like most of the other shades. It's definitely brighter than it looks in the photos - think of the colour intensity of OR205, but bright magenta pink instead of bright orange. This is probaby my favourite shade of the 5 I have. PK006 Always in Pink also has that "a little too pale for my skin" vibe, but otherwise, it is a very nice shade. For cool-toned, pale girls, this might be a bright shade that is bold but still harmonizes with your skintone. Although it's a slightly lighter shade, it covers well - the pigmentation on this is excellent, too. Lastly, RD301 I Am in Love is a straight up opaque red, so I don't have too much to say about it. If you love reds, you should definitely check this shade out. It looks nice and glossy, and feels nice on the skin, too. 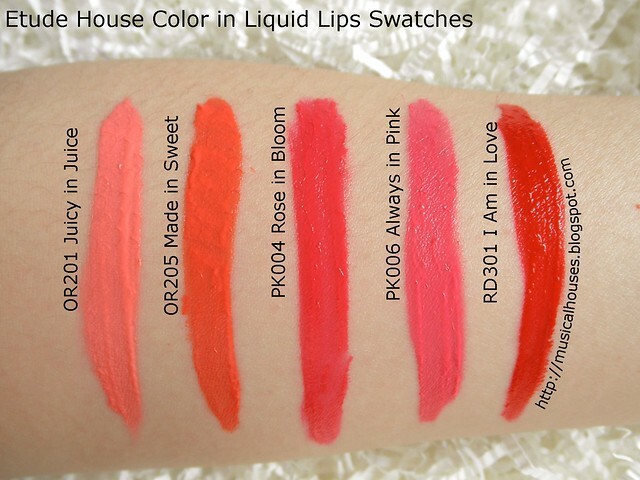 As a whole, the Etude House Color in Liquid Lips feel very moisturizing and emollient on my lips, which is in line with what I expected from the formulation of the product. They were also very pigmented, and coverage is opaque. I have pretty pigmented lips naturally, but these covered them very well. They also have some staining properties - if you apply this, sit for awhile, and wipe it off, you will see some of the colour tinting your lip, which is pretty cool. (In fact, I still have some of the Color in Liquid Lips swatch stripes along my arm, although I've already showered!) The downside is that because they are emollient and glossy, they do wear off faster than a typical, drier, lip stain might, and the lasting power is more akin to a lipgloss than a lipstick. But that's not a big deal for me, since I just reapply as and when needed. 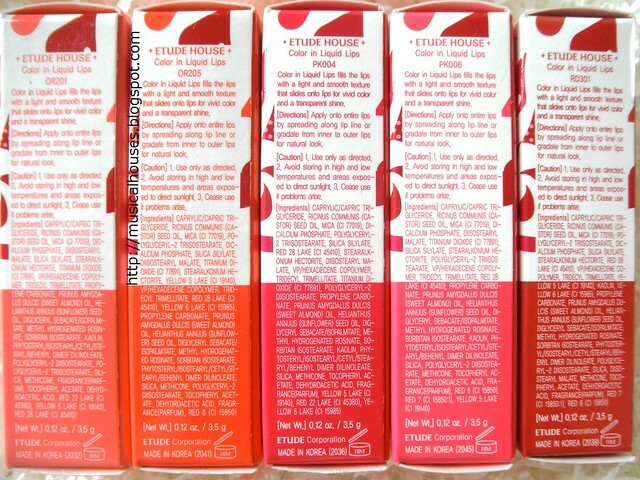 So, would I recommend the Etude House Color in Liquid Lips? If you don't expect them to last forever on your lips, then yes! These have a nice glossy texture, are moisturizing and emollient on the lips, and have great pigmentation to boot! And at SGD$17.90, they don't break the bank either. I do appreciate that Etude House puts out great quality makeup in fun, bright colurs at a price that isn't exhorbitant (and with girly packaging to boot! 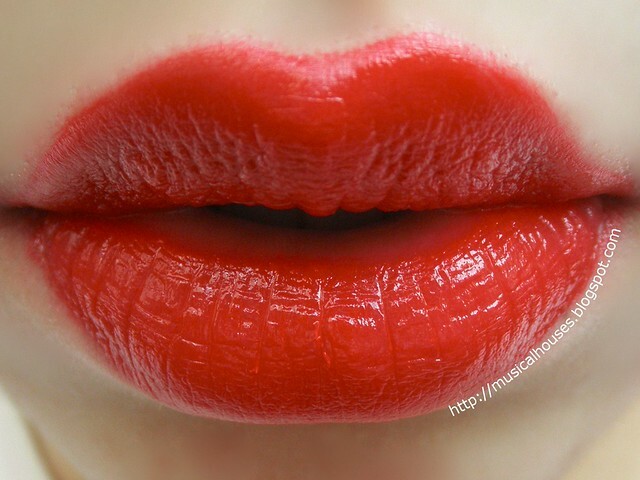 ), and the Color in Liquid Lips is no exception, either. It's definitely worth checking out if you're looking for a liquid lipstick with a glossy finish, or a pigmented lipgloss, or if you just want a cheaper alternative to the Dior Fluid Sticks. The Bottom Line: The Etude House Color in Liquid Lips are moisturizing, have a glossy finish, and great pigmentation too, at a price that makes them worth the money. Great review (I totally want these)! 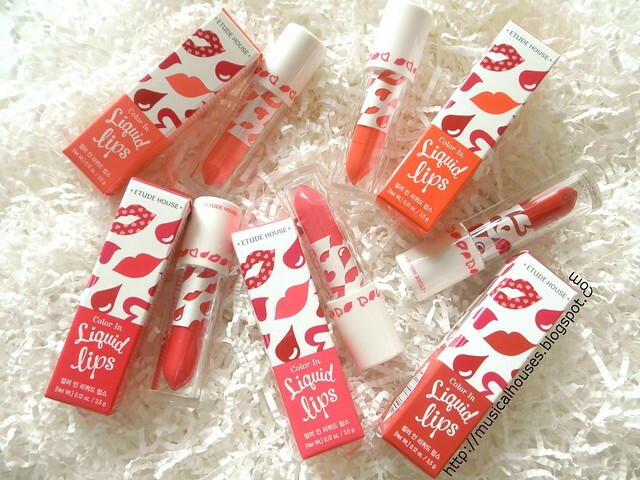 I was wondering if you know if these are similar to the Innisfree lip tint mousse? Also, do they transfer everywhere (like the Innisfree mousse)? @Arielle Berze: Unfortunately I've never tried the Innisfree version! These can move around and shift because they're more moist-feeling on the lips, but as compared to lipgloss the staying power isn't bad! Hope that helps! hmmm...interesting! The colors are pretty as well as the packaging. This is something worth checking out. @Anonymous: Thank you! It does take some research and effort (and time!) to put out these posts, but I'm glad you like them! For the Verso Eye Serum, Retinol 8 would most likely correspond to the ingredient Retinyl Retinoate. It's a fairly new retinol, and so far, has some promising research behind it to show that it could have anti-wrinkle and anti-aging effects. Unlike some of the older forms of retinol, this is also more stable (retinol is otherwise a notoriously volatile ingredient), and less irritating. So it does look promising, although the research isn't that extensive. The Verso Eye Serum seems fine as a whole. I'm not sure how much it costs (it looks like it might be pretty expensive), but in addition to the retinol, there are emollients and humectants in there, as well as some polymers and silicones to enhance the feel of the product. There are also a couple of peptides that could help in increasing collagen production in the skin, and there are a couple of plant extracts, too. So all in all, it's not a bad product. Nothing jumps out at me as being potentially clogging, or irritating, or drying. So this should be a fairly moisturizing eye cream with a lightweight, non-oily feel on the skin. i love the look of these but it looks like the lighter one will settle into lip lines. the colors are SO vibrant! !